Let’s get this lame thing started! Hard to believe it’s been four years since the paparazzi carelessly snapped this pic of me and the Prez at the 2009 inaugural in DC! I was relieved that such a steamy, suggestive display was never published during his first term. I’d hate to be Obama’s Monica, not mention the heartache for Michelle and those adorable girls. And by the way, he never called. I’m sure you’re as excited as I am for this crippled bird to bring some real change this time around. How exciting that Obama in his last four years can now stand up for all those unpopular, lonely, fringe people like the homos! From a strictly personal standpoint, I have my fingers crossed that he’ll make traveling easier by lifting the ban on aerosols in carry-on bags. Not having my AquaNet at my side is murder on my bouffant, especially when I fall asleep leaning against the window. The other day during a Greyhound layover in Akron, OH, my hair was so flat, I had to pin a dozen carnations to the left side just to look halfway normal. 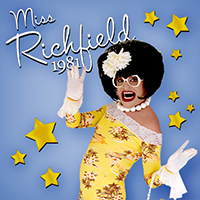 Whatever happens, I’m going to make it a great year with my new show “Sweet & Sour Richfield,” which will be unveiled on the Atlantis Events Independence of the Seas cruise in February!